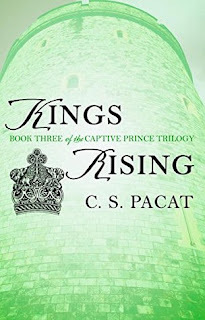 Kings Rising is the third and final instalment of the Captive prince phenomenon. It started out as an online series, but it got so popular that Penguin bought it and published it. 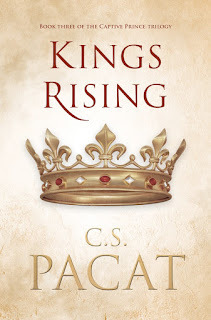 The wait for Kings Rising has been excruciating! I'm talking years here, people! When it was finally released last week, the internet went crazy! Personally, I was excited for the book, but I was also anxious to see if the fact that it was written under big publishing contract would somehow influence the quality/storyline. It's incredibly liberating to write something for yourself and later on for the fans, without any expectation of sales, ratings and royalty statements. It's very different when you write for one of the biggest publishers. And it's even more difficult when you write a gay dystopian fantasy for one of the biggest publishers. Having read the book 3 times since last Wednesday, I can report back and say that all my fears were for nothing! The book is absolutely amazing and everything I wanted! Damen and Laurent are even more intense together, and the love scenes were just as beautifully done as in the previous 2 books. I didn't feel any censorship at all in any aspect, and I'm incredibly happy about that! The cover you can see above is the American/European edition cover. I have to admit I'm not crazy about it.The cover below is the Australian edition cover. How pretty is it?? Here's the whole series together. In my opinion, the Australian ones are gorgeous and I ordered them all from Australia because I need to have them on my bookshelf! Kings Rising didn't disappoint. It was absolutely amazing! I'm not one for rereading books, I can count the books I've reread, ever, on one hand. But this series... God, this series I can read every week. I reread the first 2 before the new one came out and I got the same book hangover as I got the first time around, 2 years ago. Days later, I can't stop rereading my favourite scenes in the whole series and can't seem to pick up anything else. My head is full of Damen and Laurent and I need an intervention. What's more, I realised when I started rereading the first 2 books that I remembered nearly every scene to the letter! 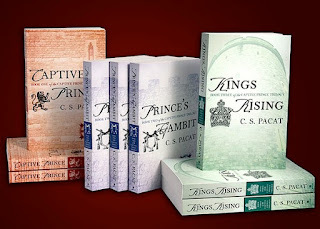 I read a lot and I forget a lot, most of the time I'm lucky if I remember the names of the main characters in a book I've read, but with Captive Prince I knew each scene play by play. The writing is that powerful. 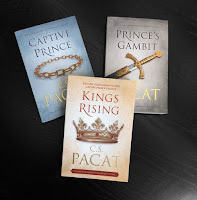 I love the AU covers too, where did you order these from?